The Oregon Index of Leading Indicators continues to be negative on a six month basis, registering an annualized -2.1% change in September, the same figure as in August. 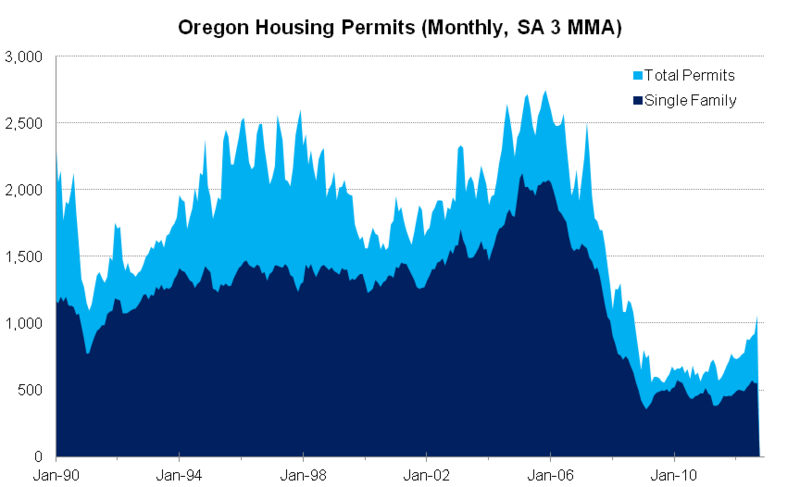 However, these negative values are due to the large drop in June when OILI fell nearly 2 percentage points alone and since June, OILI has essentially been flat to slightly positive. The University of Oregon Index of Economic Indicators is effectively unchanged for the past 6 months. See the graph below. These changes in both indexes can largely be lumped into two categories of indicators: the manufacturing or goods producing ones and then the more general economic indicators. At the moment the manufacturing and goods producing indicators are flat at best to declining while the other indicators actually are looking pretty good. The combined result between these two broad forces are flat overall leading indicators. The slowdowns in both series are largely driven by the slowdown in the manufacturing cycle that has occurred in both the U.S. and global economies. U.S. Industrial Production has flattened out in recent months, however at a high level. Industrial Production dropped about 17 percent during the recession and has regained about 14 percentage points of that back in recent years, or about 80 percent of the loss. However, upward momentum has stalled during the summer months and given Superstorm Sandy, it is unlikely to expand strongly in the past month. The Purchasing Managers Index likewise fell just below 50 for June, July and August – signaling the expansion had stopped but not registering contraction or recessionary decline – but has rebounded in September and October. 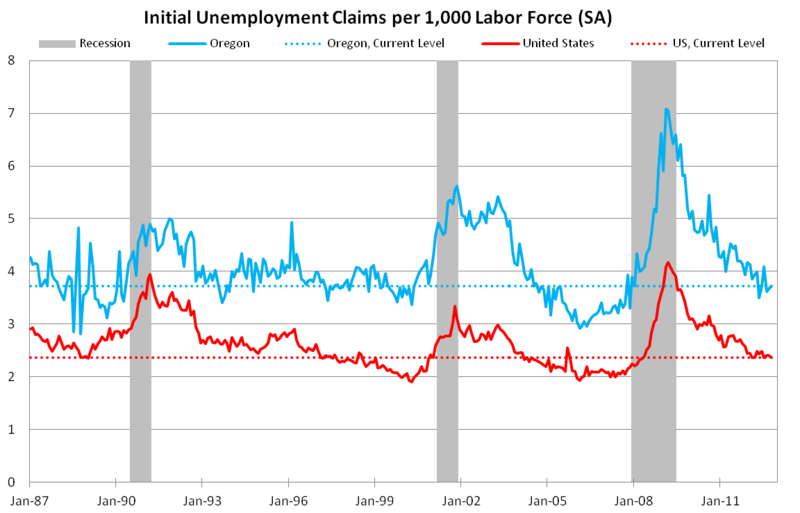 Both the U.S. dollar and Oregon trade-weighted dollar appreciated during the spring and into the summer months – making U.S. and Oregon exports more expensive worldwide – but both have recently begun depreciating again the past couple months. The University of Oregon Index also includes manufacturers’ new orders for capital goods (nondefense, nonaircraft) which declined a severe 6 percent in July alone. However since then, new orders have remained relatively steady, albeit at this new, lower level. Similarly, the air freight tonnage from Portland International Airport used in OILI has leveled off during the March through August period and declined outright in September. It is unknown at this time how much, if any, the labor issues at the Port of Portland are affecting the Aviation operations (they appear to be affecting Marine operations.) Most of the manufacturing weakness can be attributed to the global slowdown in growth. The Chinese economic slowdown (approximately 7.5 percent growth the past two quarters, slower than the 9-10 percent growth seen in recent years) and the ongoing European recession (even depression in some countries) are weighing heavily on our manufacturers up and down the supply chain. Outside of manufacturing, the other indicators are actually all looking good in recent months. Initial claims for unemployment insurance continue to fall overall in a slow and steady manner. New claims are actually back down to levels the state experienced during the 1990s expansion years and almost all the way back down to 2006 levels. Consumer sentiment has rebounded nicely and is currently back to levels not seen since before the recession. These readings confirm the consumer spending data seen in recent quarters. Sentiment had been lagging behind spending growth; however it appears consumers are becoming just a bit more optimistic. Help Wanted Ads continue to growth although these have only regained approximately half of their recessionary losses. Withholdings out of wages and salaries continue to grow as well. Recent year-over-year growth in withholdings have slowed in recent months, yet remain positive. In correspondence with other states, Oregon withholdings are outperforming many other states. Year-over-year growth is about 2-3 percent in recent months while numerous other states are seeing 0-1 percent growth. These rates are down from about 5 percent growth earlier in 2012. Finally, housing permits – one leading indicator in both Oregon indexes – continue to grow strongly, however from a very low base. One of the items discussed in the forecast and also during legislative testimony this morning was the housing recovery. The recovery is here however it remains in its beginning stages as there is quite a bit more growth needed before construction and the housing market more generally approaches anything considered normal. 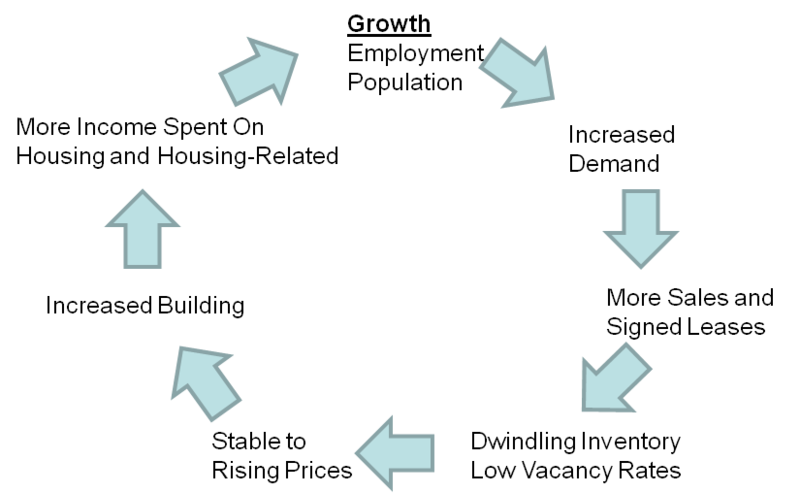 The following flow chart is an attempt to simplify what the housing recovery looks like. A key item that sparks the housing recovery is growth, in particular employment and population growth. At this point in time we are getting both and as mentioned previously, new household formation is picking back up, leading to higher demand for housing. Overall, the manufacturing slowdown is weighing heavily on both the leading indexes and also on the economy, however outside of the industry, all signs are continuing to point toward expansion. Expectations for growth remain tampered in the near term. 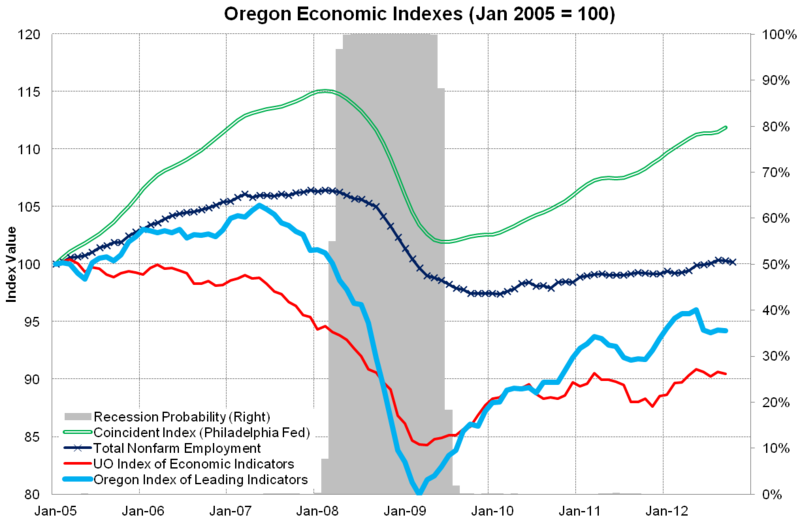 The consensus outlook, confirmed by the leading indicators, is for more of the same, slow growth through at least mid-2013. As manufacturing stabilizes and begins to grow again, plus the two main economic drags so far in recovery (housing and government) become less severe or even positive contributors, growth is expected to accelerate somewhat in the medium term.